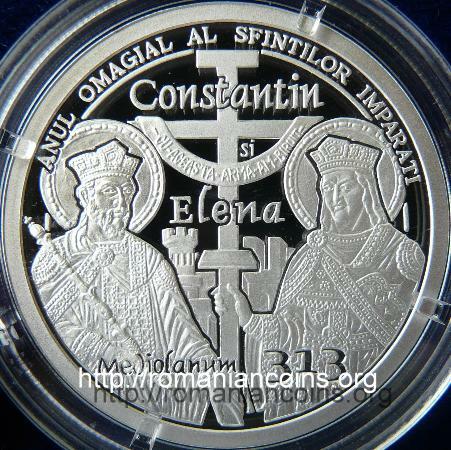 Obverse: ROMANIA, coat of arms of Romania, face value 10 LEI, year 2013, an image of the patriarchal church in Bucharest Reverse: icon of Saints Emperors from the patriarchal church, inscriptions "ANUL OMAGIAL AL SFINTILOR IMPARATI Constantin si Elena" and "Mediolanum 313" meaning "ANNIVERSARY YEAR OF THE SAINT EMPERORS Constantine and Helen" and "Milan 313"
In 313, 1700 years ago, an imperial edict issued at Mediolanum (the old name of the city of Milan from Italy) by Roman emperors Constantine and Licinius granted religious freedom to all Romans, so also to the ones that were Christians. In order to celebrate this event, year 2013 was declared as "Anniversary Year of the Saint Emperors Constantine and Helen" by the Romanian Patriarchy. Between emperor Constantine and his mother Helen a tower and a small fragment of the Constantinople's fortifications was placed, and also a cross. The horizontal arm of the cross bears a ribbon with the inscription "CU ACEASTA ARMA AM BIRUIT" meaning "WITH THIS WEAPON I CONQUERED". 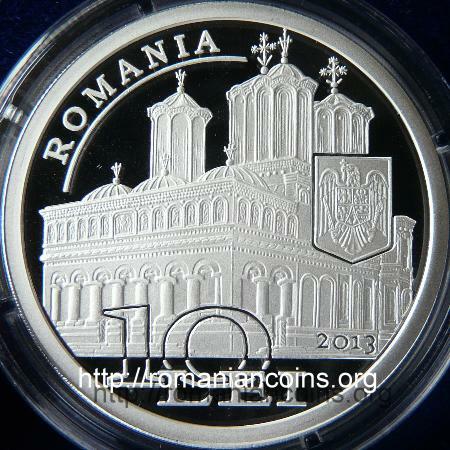 The cathedral is also represented on the 500 lei coin from 2006 - 350 years from the foundation of the Patriarchal Cathedral and on the 200 lei coin from 2010 - 125 years of autocephalous Romanian Orthodox Church and 85 years since the establishment of the Romanian Patriarchate. Unfortunately, all three pictures were taken from almost the same angle. On the 500 lei coin another image of the Saint Emperors Constantine and Helen also appears, the one from the iconostasis inside the cathedral.